This lesson will guide you through the steps to set up and use the CRDC tool in order to export your files for submission to the Office of Civil Rights. These extracted files can be submitted to the Office of Civil Rights using their data collection site. You can submit the whole file at one time, or submit pieces of the file one at a time. You will have 75 days from the opening of your state’s window to gather and submit all the required data. Landing on the tool's overview page, there is a subnavigation panel with tabs or steps to using the tool most efficiently. The tool is broken down into four sections. LEA Information pairs with the data updated in Site Management to fill out the necessary data for the LEA Extract. LEA Extract Page where you can choose all or part of the LEA file to submit based on your filtered choices in the scope selector. 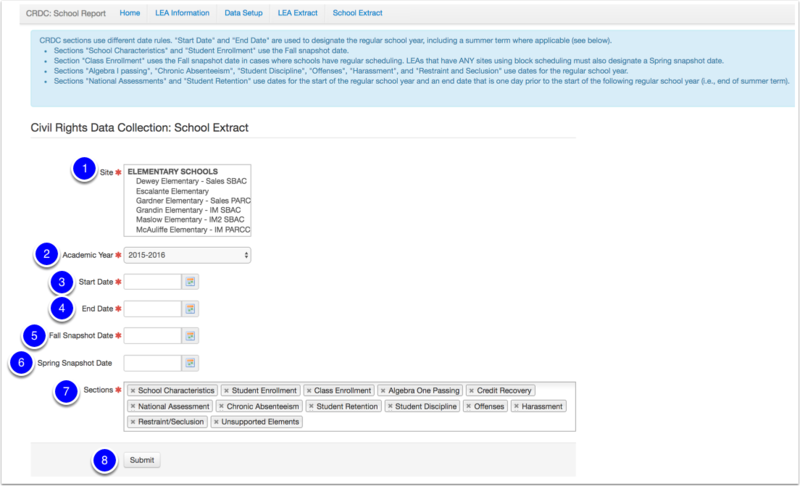 School Extract Page where you can choose all or part of the School File to submit based on your filtered choices in the scope selector. CRDC Website Link to the U.S. Department of Education site where you can find information about the CRDC. Home to be returned to the CRDC Overview page. These fields do not tie to a specific table within the Illuminate database and therefore must be answered on this page. 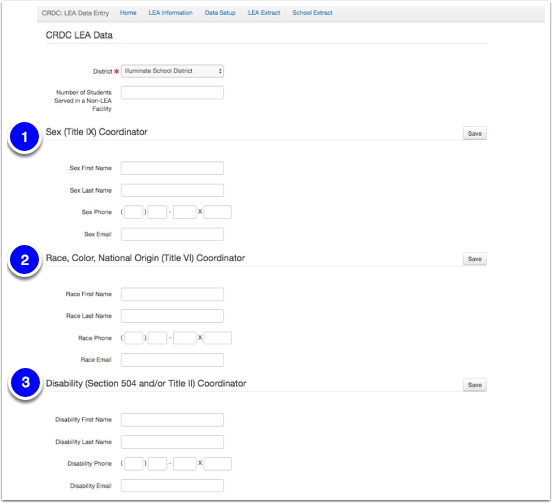 This page, in conjunction with the updated selections in the Civil Rights Data Collection (CRDC) Fields of site management will be all the data needed for the LEA Flat File. The LEA Information page defaults to the District Name because the LEA file refers to district information, not specific site information, that is setup is found under Data Setup. Who is responsible for coordinating your Title IX information in the district? Record this person’s contact information will need to be filled in here. Who is responsible for coordinating your Title VI information in the district? Record this person’s contact information will need to be filled in here. Who is responsible for coordinating your Section 504 and/or Title II information in the district? Record this person’s contact information will need to be filled in here. From here to the end of the page you will be answering a series of yes/no questions. Please remember to save every so often. Once this data is populated about your organization, the LEA Flat File will be ready for submission. Please see the CRDC FAQ for information regarding the Equivalency Exam Program prior to filling in this option. During your data setup process, please make sure to SAVE your changes often. Once you have set this page up, the data will remain held until you change it. This portion of the tool can be done at the District Level and does not need to be done at the site level. Elementary Schools do not need to fill in this section, unless they have a course catalog similar to secondary. Courses is where you align the appropriate courses to each area. This set of multi-select boxes will allow you to search by at least 1 character for the appropriate courses that fall within each subject matter. We suggest working with whomever manages your course catalog to make sure that all courses that were taught in the submission year are added to the correct subject matter area. Civil Rights Data Collection is also an area also located on Course Details. However the two are not connected. For available prebuilt reports and custom reporting, continue to record courses as appropriate with CRDC Details. Available selections are typically created and stored within User Management under Credentials. 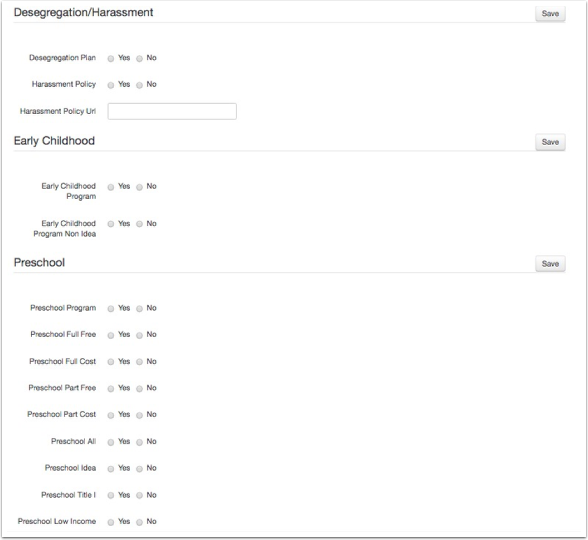 Feel free to visit User Management FAQ to add or manage necessary fields. Check out the CRDC FAQ for more information. 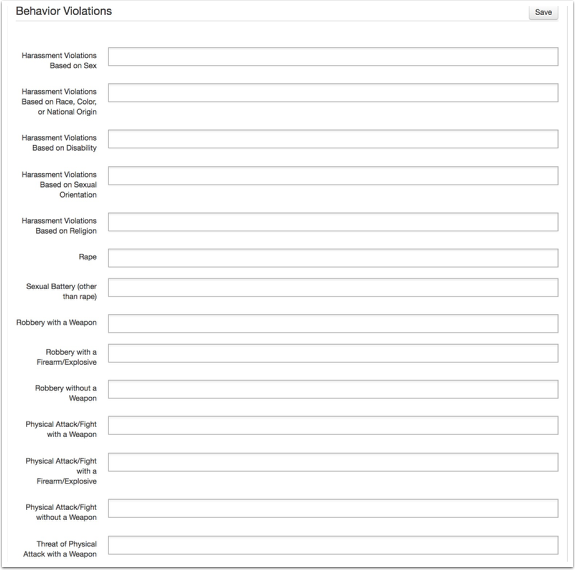 Behavior Consequences as created in your Code Managmeent will be available here. Map your consequences values as appropriate. The scope selector is designed to look at the specific code table that the data is drawing from. Behavior Bullying Categories are coming from your Behavior Motivations. Visit Code Management to manage your current selections. Behavior Violations are coming from your Behavior Violations. Visit Code Management to manage your current selections. Graduation Status refers to the exit codes that are applied on the student demographics page (below). Which exit codes are being used is dependent on the organization. Now that the data setup has been placed, it is time to prepare and create the LEA Extract required for submission. You are creating a .csv file to be uploaded to the OCR, please do not open this file prior to submitting it. Opening a .csv file in the wrong program can cause the data quality to change, which will make the data that much harder to upload. If this does happen, please just regenerate the file and submit as you normally would. Academic year will default to the current submission window. Start Date needs to be set to the organization's start date for the 2015 2016 school year. End Date needs ot be set to the organization's end date for the 2015- 2016 school year. Fall Snapshot Date is suggested to be 10/01/2015. While the organization can choose their fall snapshot date, this is Illuminate's recommended practice. Please see the CRDC FAQ for further explanation on Snapshot Days. 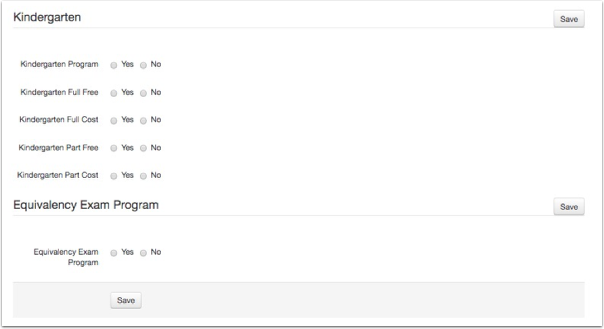 Sections allows you to select to create one section using the scope selector, or all of the sections at one time. To remove a section simply click on the “x,” to add the section back in simply click on the box and the available sections will reappear as dropdowns. Select the section you’d like to return to the scope selector and submit when ready to generate the file. Submit will create the file and download in your devices downloads. Now that the LEA Extract is complete and ready, it is time to create the School Extract. Select the Site(s) to run this extract for within your organization that is required to report data. End Date needs to be set to the organization's end date for the 2015- 2016 school year. Fall Snapshot Date is to be set to 10/01/2015; some sections of the school file will calculate based on either the full year, or Fall Snapshot Date. Spring Snapshot Date is to be set to 03/01/2016; some sections of the school file will calculate based on either the full year, Fall Snapshot Date or Spring Snapshot Date. Select Submit for each School Extract or site file you are creating, which will download into your devices downloads. 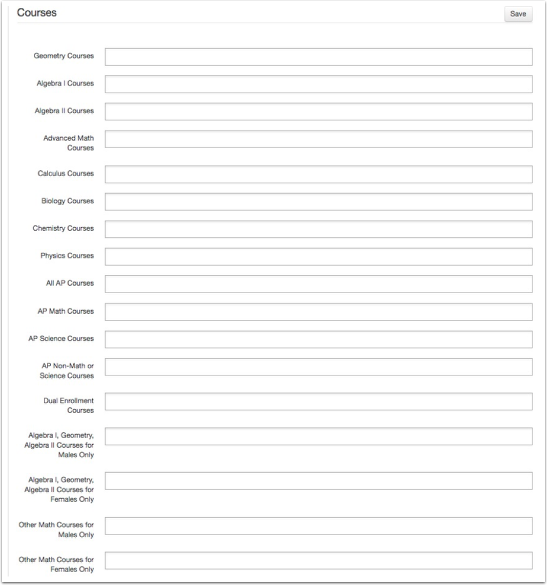 A job queue list of records generated for the past 30 days are available below. This will show the start and end time, file status, and provide a file download link for the CSV record created. Take a look at our Civil Rights Data Collection FAQ!